Well I really enjoyed Jodi Picoult’s My Sister’s Keeper so I borrowed Plain Truth (thanks Lyndsie!). It was really good too! Katie Fisher is 18 and Amish. When a dead neonate is found on her family’s farm, she not only denies the murder, but also the pregnancy and birth, despite all the medical evidence saying otherwise. Ellie Hathway, a distant relation who is becoming a well-respected Philadelphia lawyer, takes on the case as a family favor. Ellie has come to the farm to reevaluate some aspects of her life, including the cases in which she helps guilty men walk free, and the fact that she is 39 and wishes for a child. When bail is set, Ellie is required to go live on the farm and keep track of Katie. And so Ellie is forced to adjust to an Amish lifestyle. She is the outsider in the community, and is trying hard to defend a client who she feels is not honest with her. To help her defend Katie, she calls an old friend, Dr. John Cooper, who is a clinical psychiatrist. Cooper tries to evaluate what exactly Katie is repressing, and helps Ellie figure out what really happened to the dead infant. In the process, he and Ellie must work out long unresolved issues between them. Learning about the Amish culture and way of life was really enlightening to me. I enjoyed watching Ellie’s transformation from resentment and frustration towards this way of life to a quiet respect for the people and the practices. 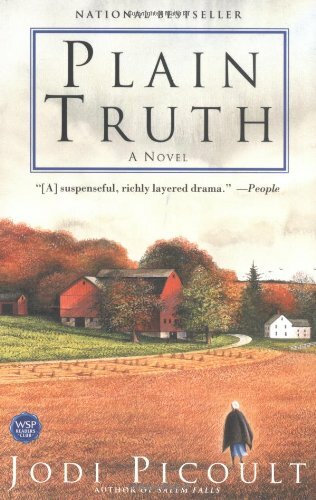 While not as powerful as My Sister’s Keeper, Plain Truth is a very well-written, fascinating look into another culture within our own society, and a courtroom drama to boot! I thought the beginning of the book had a bit more spark, but I wasn’t disappointed in the end. Check out my review of My Sister’s Keeper by Jodi Picoult. This entry was posted in Book Reviews, General Fiction and tagged Amish, Fiction, Jodi Picoult, My Sister's Keeper, Plain Truth. Bookmark the permalink. Great to see a young woman’s book -related blog! If you like Jodi Picoult, consider checking out another author published by the same team — me! STANDING STILL got great reviews — but I still need to get the word out. Thanks! Thanks for reading the review! I will definately check out Standing Still! Thanks for the recommendation, and congrats on the book! I liked this one, too. My Sister’s Keeper was my first Jodi Picoult book and the ending really shook me up.